Some construction jobs require employees to be able to perform their duties around the clock. Working at night comes with its own unique set of challenges, not the least of which is the need to provide adequate light to work safely and efficiently. 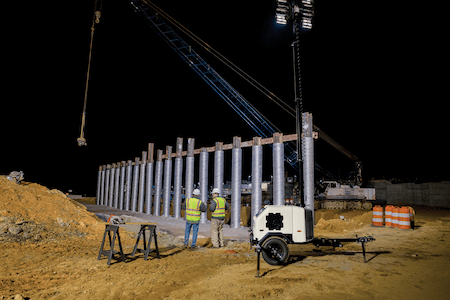 Light towers are your answer to this problem and, when used correctly, can be used to illuminate a work area and provide a safe and comfortable work environment through the night. 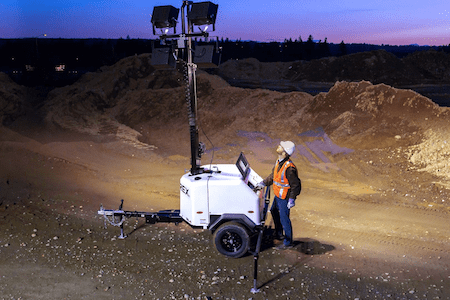 If you have an upcoming project that requires night-time activity, you may want to strongly consider obtaining at least one light tower, depending on the size of the work area. It may be surprising to learn that light towers have a rich history that dates back to before the discovery of modern technology. In fact, what we refer to today as lighthouses were originally called light towers. The first light tower to be commissioned by the United States was constructed in 1806. Just like the light towers of old, modern light towers are widely used to illuminate areas of activity and provide a safe working environment in low-light conditions. The first iterations of modern light towers were originally called moonlight towers. These were typically triangular, rocket-shaped structures that contained some small lamps at the top and were used as street lights in the late 1800s. These early towers were quite large, measuring around 200 feet tall and weighing about 10 tons each. Over time, as electricity became more commonplace, these original designs were modified to become the light towers you're used to seeing today. Modern light towers come in a variety of shapes, sizes, and power sources, providing plenty of options to choose from to meet your specific lighting needs. These towers can range in size from several feet tall to towers that are over 24 stories high. Light towers allow for work to take place at times and in places that are otherwise restricted by dark conditions. Most commonly, you'll find light towers that extend to a total height of about 30 feet at a construction site. Specific models will vary, but you'll normally see four to six light fixtures at the top of these towers. Light towers typically make use of metal halide bulbs, or something similar. Ultimately, the height and number of bulbs included will be a determining factor in choosing the right tower for your job. You're going to need to consider the amount of area you need to cover and the level of illumination you need before making your selections. In the most common scenarios, you'll find light towers being used in new building construction, building repair and maintenance, and in road construction and maintenance. There is no limit to the potential uses of light towers. They have been used in unexpected ways, like providing lighting solutions for outdoor public events such as festivals and sports games. As long as light towers are properly and safely set up, their possible uses are virtually limitless. Because light towers come in a variety of sizes, they're quite versatile in their potential applications. Further adding to this versatility is the fact that light towers are capable of drawing power from a number of sources. The most basic source is, of course, connecting the tower directly to the city's power grid. This isn't always possible, though. 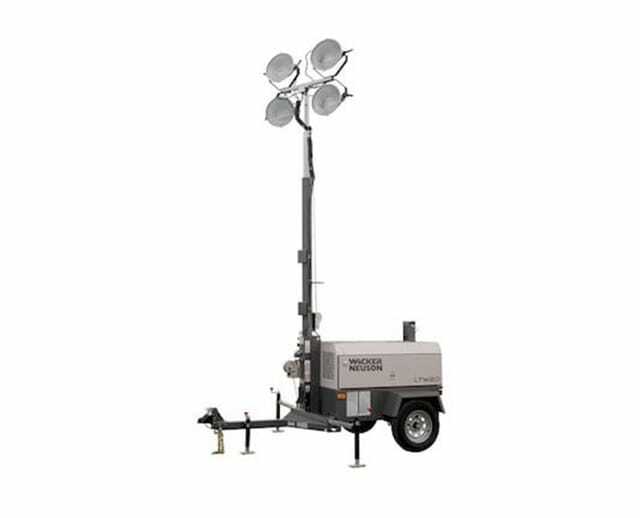 For this reason, many light towers can be connected to generators, or even battery power, to provide the level of portability that is often required when lighting more secluded work sites. Traditional light towers are the most commonly used variation and can almost always be found on building and road construction sites when work is required to continue through the night. This is still a rather broad term, though, and applies to some variations regarding size, power, and area of illumination. A standard, the traditional light tower will usually extend to around 30 feet high and include four to six 1000-watt light fixtures equipped with metal halide bulbs. 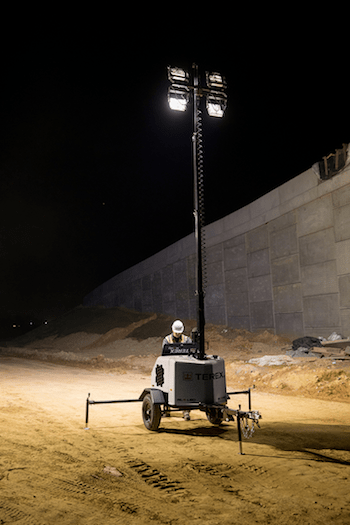 This is the go-to lighting solution for most construction sites because of their portability and the broad area of illumination they provide. A typical construction site will make use of somewhere between one and five of these light towers, which is usually more than enough to light a large area. There are many variations on traditional light towers, including those designed to withstand high temperatures up to 120 degrees Fahrenheit, extendable towers that can easily lift to 40 feet or more, and multi-bulb designs made to illuminate a larger area per tower. Balloon light towers, while lacking in the higher-power illumination capabilities of traditional light towers, are becoming more and more popular. Balloon light towers are more compact and can be set up quickly. They often consist of a single, large LED bulb or casement of LED bulbs that provide up to 360 degrees of lighting. This solution is of particular interest for road construction crews, especially when flaggers need to be easily visible to passing drivers. Balloon light towers are often rounded in shape and designed to be low-glare, making them a more appealing option when high-power illumination is not required. They're more popular at sporting events and outdoor festivals thanks to their high portability and relatively low power requirements. Keep in mind; balloon light towers don't provide as much luminosity as their traditional counterparts. For this reason, their convenience factor alone may not make them the best choice for your construction site since you'll need far more of these to illuminate a large area. Finally, high-mast light towers are rather permanent installations. They are most commonly used when erecting structures such as bridges, highways, etc. Although they're permanent, high-mast towers are usually put in place before construction of the actual structure begins since they can provide plenty of light across a large area, providing construction crews all of the lightings they'll need for the duration of the project. Once construction has been completed, high-mast towers are normally left in place to serve as high-powered street lamps along highways and bridges. 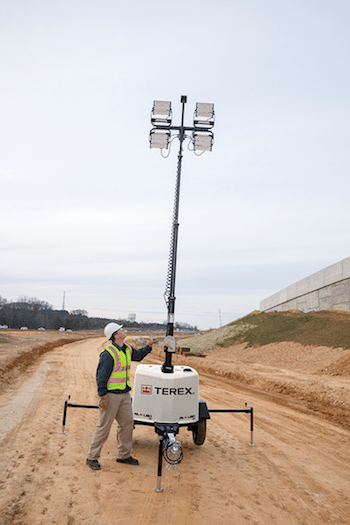 Before you walk into any equipment provider warehouse or browse for light towers online, make sure you've answered as many of these questions as you can. Of course, if you need help thinking through these, a professional from a rental company like BigRentz can help you determine what your exact needs are. Once you understand your requirements, you'll have a much easier time selecting the right light tower for your next job. It's important to choose a light tower that is scalable for site conditions. Generally speaking, larger construction sites will require higher-power light towers, preferably with a greater elevation. The more powerful your bulbs are and the higher you're able to raise them, the more area you'll be able to illuminate with fewer towers effectively. Your ultimate goal should be providing adequate lighting with as few towers as possible. However, larger light towers require more work to set up and are more permanent installations. This isn't to say they can't be moved, but the work and time involved increases along with the size of the tower you select. How permanent your light tower is should also be something you take into consideration, especially if you're looking at a short-term job. Even if your work site covers a large area, you may want to consider smaller, more portable towers that are less work to set up and take down. This is particularly important if your work site is not static and you're expecting to move from location to location over the course of the job. A good example of this concept is a road construction job, which requires workers to move equipment as the job progresses constantly. If you're working in rough terrain or severe weather, such as snow, you'll want to consider this as well. Certain light towers are specifically designed to work better under these conditions, so make sure you bring this need up with a professional when you're ready to purchase or rent your towers. The type of power you'll need will largely be determined by the nature of your job, its location, and the availability of municipal electricity. This may influence the type of light tower you select for your particular job. The ideal solution is to connect to traditional electricity, if at all possible. This is always going to be the most reliable source of power. Unfortunately, this option is rarely available at most work sites. Portable generators can be used to power light towers on even remote job sites. The second best option is to use a gas- or diesel-powered generator to provide power to your light towers. In the long run, this may be more expensive than using electricity, but generator power is much more reliable than using batteries. 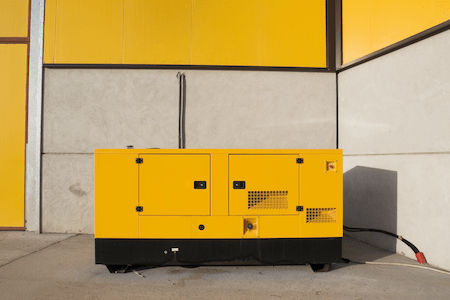 Generators also provide an additional measure of portability, making this power source ideal for mobile construction crews working on projects like road construction or larger constructions sites that may not require work to happen continuously across the entire area. Your last option is battery power, which should only be used when all other options have been exhausted. Batteries can drain quickly and require regular charging and replacing. For this reason, it is highly recommended that you only use battery power if your construction site is in a secluded area where other power sources are difficult to come by. Battery power is, however, the most portable of all options available, so you should consider that when you make your final decision. Be sure to keep the area around the light tower clean and free of objects such as tools, trash, and debris. Doing this can help prevent tripping hazards, which could lead to falling injuries, broken bones, or concussions. By keeping the area around your light towers clean, you'll be taking steps to help avoid an otherwise hazardous situation. Never set up a light tower on a soft or uneven ground. Your operating surface should be as hard and level as possible to prevent the equipment from tipping over. You're going to need to make sure the trailer and outriggers of the light tower are completely level before raising the tower. This should be checked at the beginning and end of each shift to make sure nothing has changed with the equipment. It's important not to overlook this step because terrain can shift unexpectedly from one day to the next under certain circumstances. The tower should only be raised when the equipment is in use and should never be raised in windy conditions. Be sure the tower is lowered at the end of each shift since you never know what weather conditions might bring during non-operational hours. Preventing equipment tipping is extremely important. Not only do you run the risk of facing expensive repair costs, but a tipping light tower can increase the risk of injury to nearby construction workers. At the beginning of each shift, light towers should be checked for proper grounding. Additionally, the equipment should be checked thoroughly for loose, frayed, or severed electrical wires before the tower is switched on. By making sure these issues are checked on a regular basis, you can help prevent serious electric shock or burns. By following these safety guidelines, you'll take some important steps toward avoiding potential accidents, injuries, and damage to expensive equipment. Overlooking these recommendations can have serious consequences. Purchasing light towers outright can represent a major investment for your company. If you don't need to use them on a regular basis, or your projects demand a variety of light towers, this may not be the most financially responsible course of action. For this reason, most companies choose to rent equipment of this size and cost when they need it, rather than to purchase. While renting your light towers can be beneficial, it's important to select your equipment provider carefully. Not all rental companies are equal, and you're going to want to make sure you get your equipment from a reliable and trustworthy provider. Companies like BigRentz specialize in renting out construction equipment like light towers. BigRentz is one of the most trusted construction equipment rental companies in the United States and has locations all over the country for your convenience. When you rent your equipment from a company like BigRentz, you know you're going to get quality, well-maintained light towers that can be trusted to keep your work site safe and well-lit for the duration of your project. 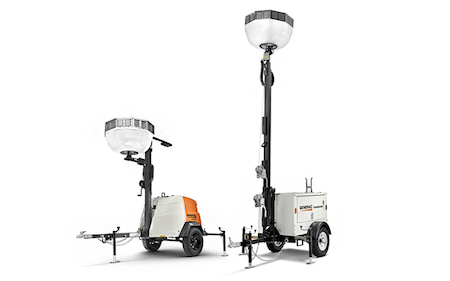 A light tower rental professional from BigRentz can also help you identify your specific needs and select the right light tower from their extensive inventory of available equipment. These days, a lot of companies are interested in using equipment that creates reduced or zero emissions. 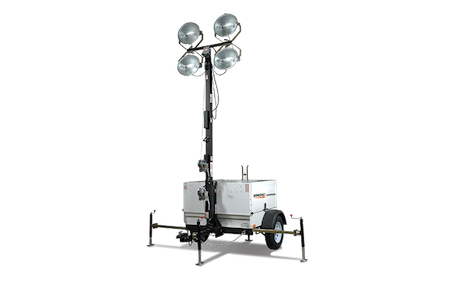 If you're interested in eco-friendly light towers, you'll be happy to know there are plenty of options available to meet this requirement under most circumstances. LED light towers create a much smaller carbon footprint than towers that use metal halide bulbs and often require less power to operate over more extended periods of time under normal conditions. While LED light towers are slightly dimmer than their metal halide counterparts, the difference is often small enough that the reduced emissions they create and potential cost savings outweigh this. Another option to consider is using battery-powered light towers, rather than diesel- or gas-powered generators. Battery powered towers create virtually no emissions, making this a great option for eco-minded companies. This can be a great selling point when you're dealing with customers who are environmentally conscious. When used in conjunction with LED light towers, battery power is among the most eco-friendly choices you can make. Light towers are extremely useful when you've got a construction job that requires employees to work through the night. When used under the right conditions, this type of equipment can help create a safer working environment in low-light conditions. Companies like BigRentz specialize in renting construction equipment like a portable solar light tower. For more information on this equipment, or to begin the rental process for your next job, you can visit their website, or speak to a professional over the phone by calling them directly at (888) 325-5172. A professional at BigRentz will be happy to help you select the right tower for your next job.